Also published as A Treasury of American Poetry. 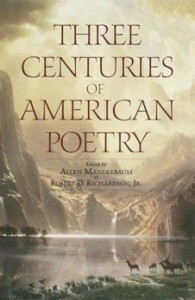 A large anthology of poetry in America in English, from the beginning to the mid nineteen twenties. Besides the usual suspects, popular poems, parodies, ballads, and song lyrics are represented. Some annotation has been included. From the Colonial Era to the early Twentieth Century – three hundred years of the America’s best poetry. A comprehensive overview of America’s vast poetic heritage, Three Centuries of American Poetry features the work of some 150 of our nation’s finest writers. It includes selections from Anne Bradstreet, Ralph Waldo Emerson, Henry Wadsworth, Longfellow, Emily Dickinson, Edgar Allan Poe, Walt Whitman, T.S. Eliot, Ezra Pound, William Carlos Williams, e.e. cummings, Wallace Stevens, Robert Frost, and Gertrude Stein, as well as significant works of lesser known American poets. From the Revolutionary and Civil Wars to the Romantic Era and the Gilded and Modern Ages, this unrivaled anthology also presents a memorable array of rare ballads, songs, hymns, spirituals, and carols that echo through our nation’s history. Highlights include Native American poems, African American writings, and the works of Quakers, colonists, Huguenots, transcendentalists, scholars, slaves, politicians, journalists and clergymen. These discerning selections demonstrate that the American canon of poetry is as diverse as the nation itself, and constantly evolving as we pass through time. Here, in one distinguished volume, are the many voices of the New World.